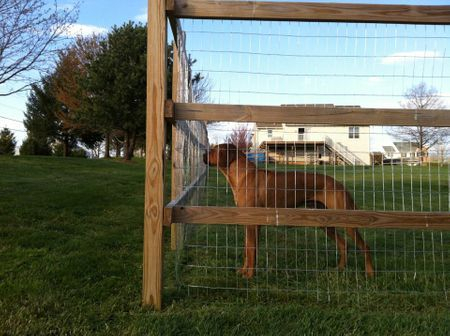 A recent request about appropriate fencing for Ridgebacks has prompted me to make this page. 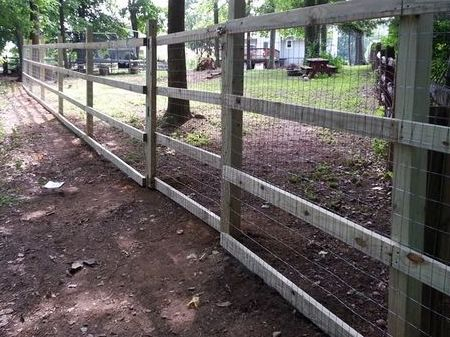 There are many different types of fencing available. There are several different types of materials and styles that I couldn't possibly cover them all. The cost range is also great as well. In my second home, I was not willing to spend ten thousand plus dollars on a fence, so began to search what was the most cost effective. I will also tell you what I have done in the way of fencing that has worked for us. 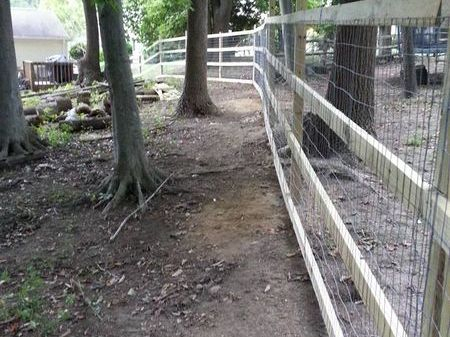 As far as cost goes, a wooden rail fence with wire mesh is most cost effective and can be done yourself. It will probably last ten to twenty years before boards would need to start being replaced due to weather and wear. 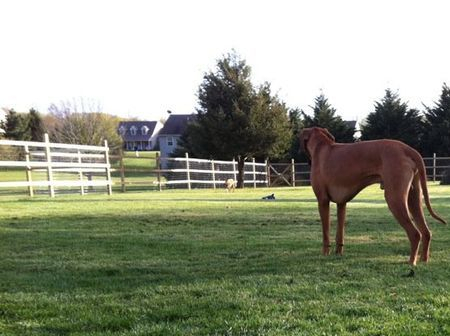 The downside is the dog can see out, but if the fence is tall and sturdy enough, it shouldn't be an issue. I also think if the dogs can see out of the yard, if there's something that raises a concern and they sound the alarm, I can see it too. Also I prefer my yard not to to be closed in completely, as I have seen the damage that high winds from storms can do to a solid privacy fence. Our current property backs up to an easement and we frequently have people walking behind our property. I like the fact that they can see my big dogs barking at them. Height wise, I would not do a 4 foot fence. 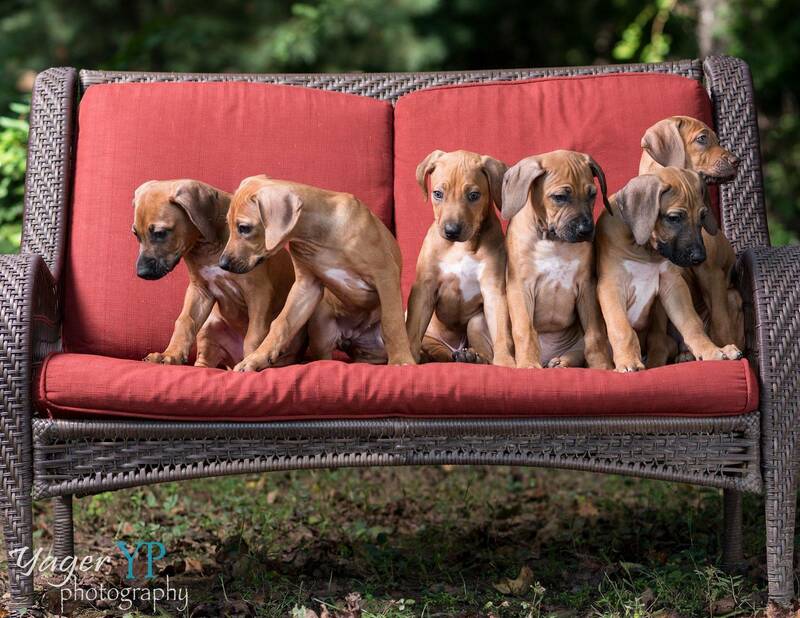 A Ridgeback can easily clear a 4 foot tall fence and a 4 foot fence will keep very few Ridgebacks contained. Our fence is 5.5 feet tall. I have installed two different fences at properties I have owned and I feel the wooden rail fence looks nice and works well. Below are pictures from my Pennsylvania house with 3 rails as well as our current home in Maryland with 4 rails. I felt the 4th rail on the bottom was needed in our new house to prevent puppies from digging under as well as small animals or neighbor's dogs from digging into our yard. With a 5.5 foot fence my male could reach the top rail while standing upright on his hind legs and just get his nose to the top. At a friends house, I watched him teeter with his feet on the top rail of a 4 foot fence and knew it wouldn't keep him in our yard if he saw something to chase. Details..... Both of our fences were not built by a professional as the cost estimate was in the ten thousand plus range. My PA property was an acre of grass, our MD property is just under a half acre in the woods. I read about building fences, I read about the frost line and learned that my post holes would have to be 2 feet deep (below the frost line). I put up some stakes and ran a nylon string around the yard to keep everything straight. I marked post holes just shy of every ten feet, and (this is important) made sure the gaps for the gates were big enough to get the lawnmower, wheelbarrow, grill and trash can through. I also created a gate so a vehicle could be driven through. I purchased an auger from Home Depot, dug all the holes and sunk 4"X4"x8' posts. I concreted every other post for stability with 30-40lbs of Quickrete concrete mix. I did not mix the Quickrete with water, but poured it in after the posts were plumb and level and ready to fill in. Then I added a small amount of water, knowing that the concrete mix would pull moisture from the surrounding dirt. I let the posts dry for 24 hours before rails went up. 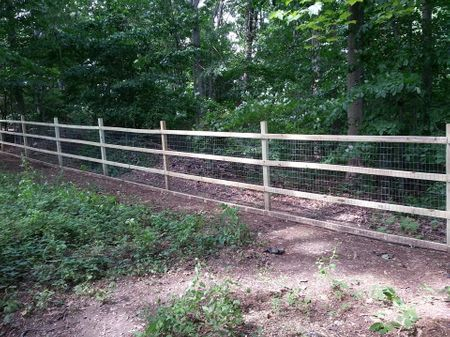 I used 2"X4"X10' for rails, then installed 60" tall mesh horse fencing with 2"X4" holes. Installing the mesh was probably the most tedious part as I used galvanized staples (not those flimsy staple gun staples), the kind you have to hammer in by hand, to hold the fencing onto the wooden rails. Lastly I built the gates and found some heavy duty latches at the local lumber yard. I did find that it was cheaper to order the lumber from 84 lumber or a local lumber yard instead of purchasing from Lowe's or Home Depot. You will save about $1 (or more) per board that way and the lumber is better quality. 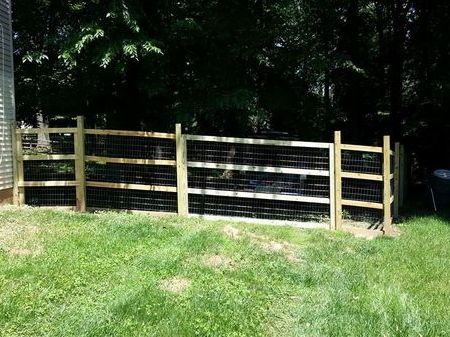 With 400 feet of fencing at our Maryland house, that's a lot of money saved. The rolls of galvanized, welded wire, horse fencing I did get from Home Depot, as they had the best price for the 60" welded wire horse fencing. To get 5.5 feet out of my 60" mesh fencing I installed the bottom rail slightly off the ground and the bottom of the top rail at 63 inches from the ground.